Direct coating technology could eliminate the need for painting and results in a durable finish. 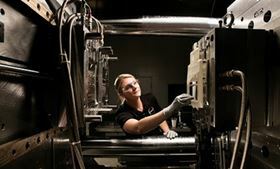 Hyundai America Technical Center and coating specialist Covestro LLC have joined forces to explore a new processing technique called direct coating to make high-gloss piano black for interior and exterior automotive trim components. Direct Coating technology combines conventional thermoplastic injection molding with reaction injection molding (RIM) to deliver a hard polycarbonate blend substrate with an ultraviolet-stabilized, scratch and chemical-resistant polyurethane coating with a piano black finish. Recent prototypes have used a Covestro PC+ABS blend material and aliphatic polyurethane coating raw materials which were tailored to impro ve adhesion between the two material formulations while also meeting the chemical and mechanical performance requirements of the finished part.